Bonjour and welcome to our Art of the Home photo gallery of beautiful backyard pergola design ideas. We hand-picked them just for you…hope you enjoy the visit! From simple to lavish, backyard pergolas are a great way to provide function and beauty to your outdoor space. They are your more budget-friendly outdoor partner, a relatively easy DIY project for the family and a beautifully relaxing area that can blend with many backyard designs. Pergolas can stand on their own and can also work well with other structures such as a patio or deck. Its placement helps delineate outdoor rooms such as a seating area while its architectural design lends support for landscape plants, grapevines, and crawlers. Pergolas minimally filter the elements (depending on the space between your pergola planks) but their openness is what provides that look of simple refreshing elegance. As you can notice from the backyard pergola ideas below, shade for open top pergolas can be provided by lush plants or vines and fabric. Now, if you prefer maximum coverage while still retaining the view of the sky and the moonlight, glass is an option. For eco-friendly homeowners, roof solar panels can provide wire-free lighting. Durable flooring options for your outdoor retreat under the pergola include: wood planks, stone pavers, tiles or even pea gravel. And you can personalize your pergola with weather friendly curtains, soft lighting with string lights, or maybe a swing or a mini chandelier for added romance. Stone pathways, lush crawling grapevines, colorful flowers and small trees surrounding your pergola are all elements that can induce a wonderfully relaxed state. After all, there is nothing like enjoying a fresh morning amidst your dedicated green refuge, or taking well-deserved time off in the afternoon after a long day’s work. 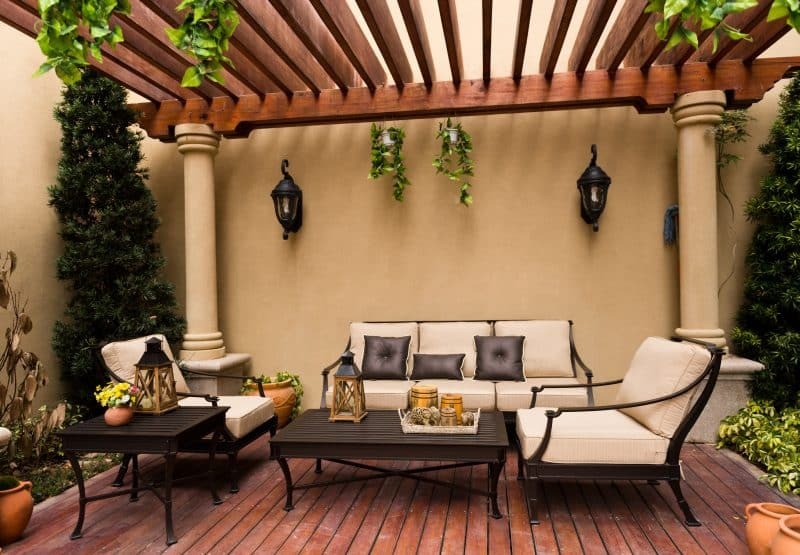 So here are the backyard pergola ideas we selected for your visit today. 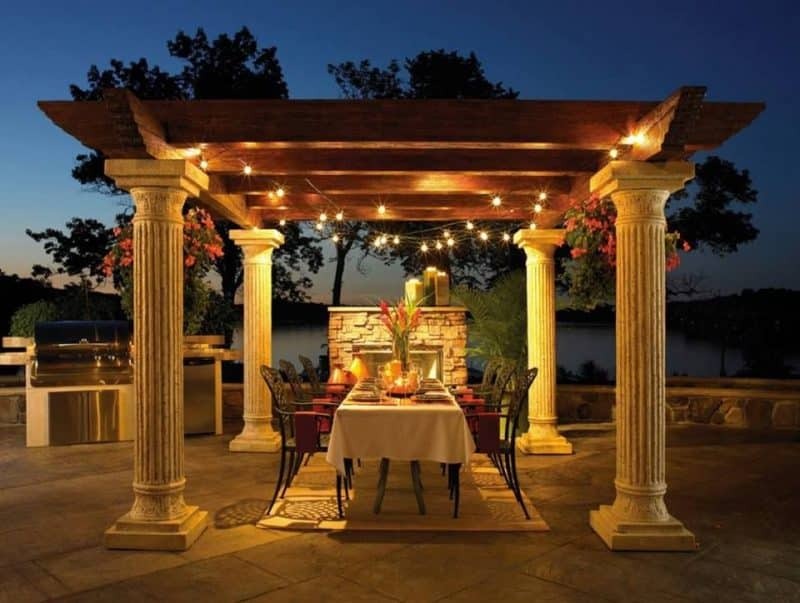 Whether you are considering adding a pergola to your existing patio or weighing your options as you are dreaming up your outdoor living project, we hope our gallery will give you a few ideas. Enjoy and beautiful day to you! The Little Plus: the outdoor dining area — pretty in pink. Love how the attached pergola with its spaced-out roof boards allows more sunlight into the space and lets you enjoy the sky as it changes throughout the day. And how about the warm terracotta tile floor? 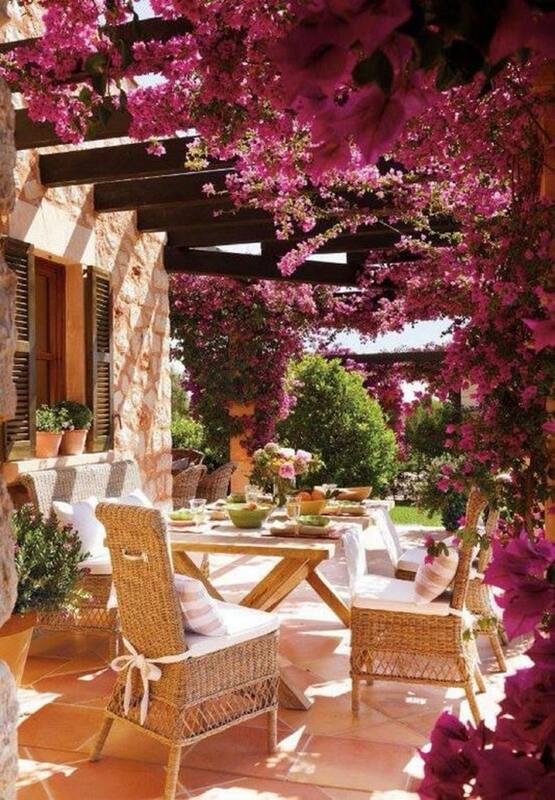 It adds to this patio’s Mediterranean feel and complements the lush array of surrounding bougainvillea blooms. Meals (and even coffee!) with loved ones will feel that much more special. 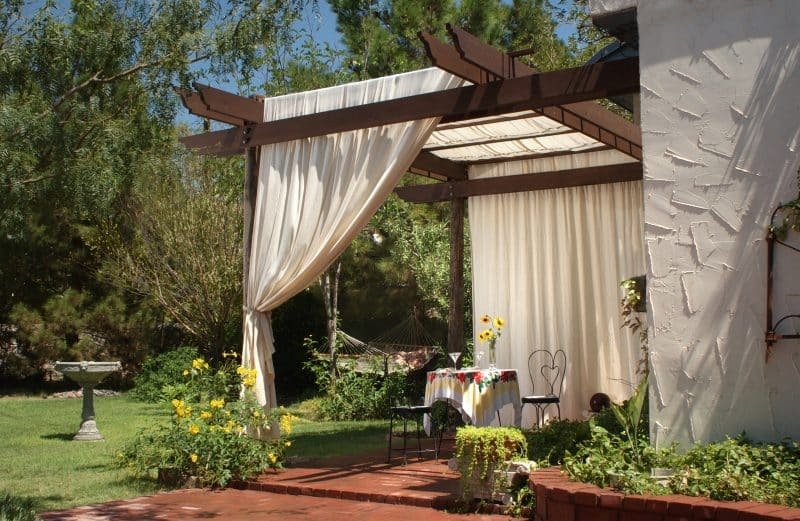 The Little Plus: the veiled cotton sheet draped along the slats of this wooden pergola. It provides the right amount of shade to your retreat. And notice how brick pavers step up to the pergola to let you know you’ve entered this outdoor oasis. The Little Plus: the sliding doors opening up to a secret surprise…a cozy respite despite the smaller space. 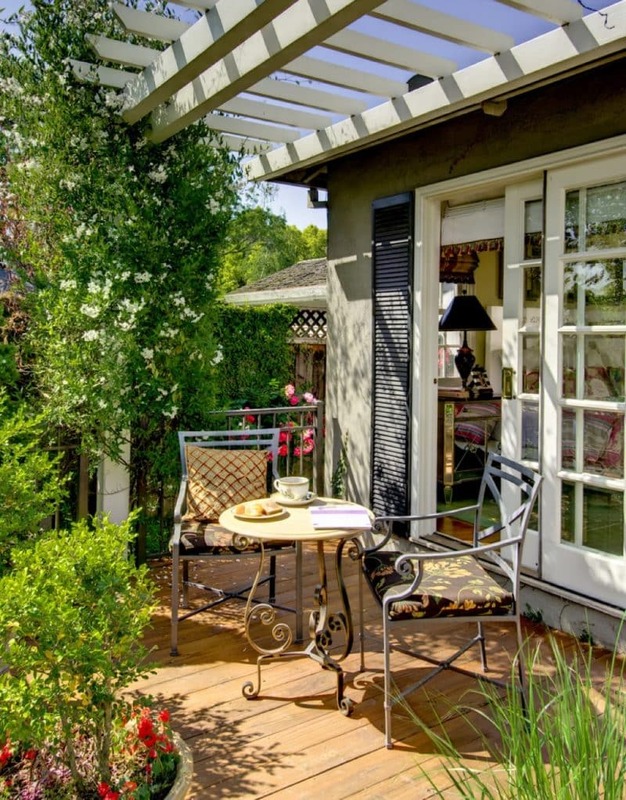 This petite deck with a pergola extension to the primary structure’s roofline is quite charming. Antique looking wrought iron coffee table and chairs, café au lait, conversations with your significant other — best date ever! The Little Plus: the detached patio with pergola supported by Roman columns. And notice the well-stocked outdoor kitchen, not to mention the stone fireplace to keep guests warm and toasty during colder nights. And to add a romantic touch, notice the mantel lights and hanging lanterns strategically placed on the pergola planks — nicely done.